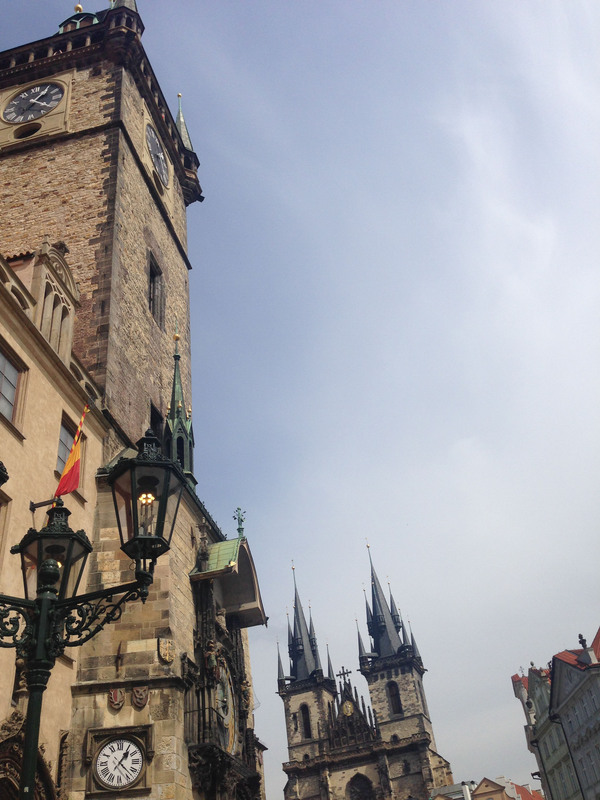 Prague is a beautiful city, and rightfully known for its spires. One of its most striking buildings possesses some of the most soaring spires, and as an added bonus, spires upon those spires. How very Prague. This is the Church of Our Lady Before Týn. 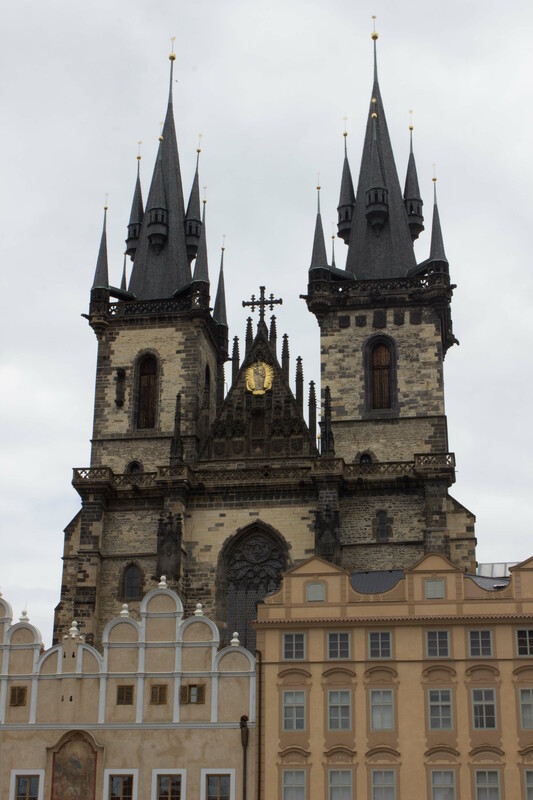 A Gothic church that dominates the Old Town Square of Prague, Our Lady Before Týn is the third church to occupy the site, and the grandest. It was built in the 15th century, all in the Gothic style, replacing an early Gothic church, which itself replaced a Romanesque structure that may have been as old as the tenth century. Currently, it is fronted by relatively simple buildings on the square, which now house restaurants, shops, and galleries, and this provides an interesting contrast between the squat and low burghers’ houses and the soaring Gothic elegance of the church. If you look at the façade, you’ll notice a gold sculpture of the Virgin Mary above the doorway between the spires (and spires). This has an interesting history, since it was not always a sculpture of Mary. 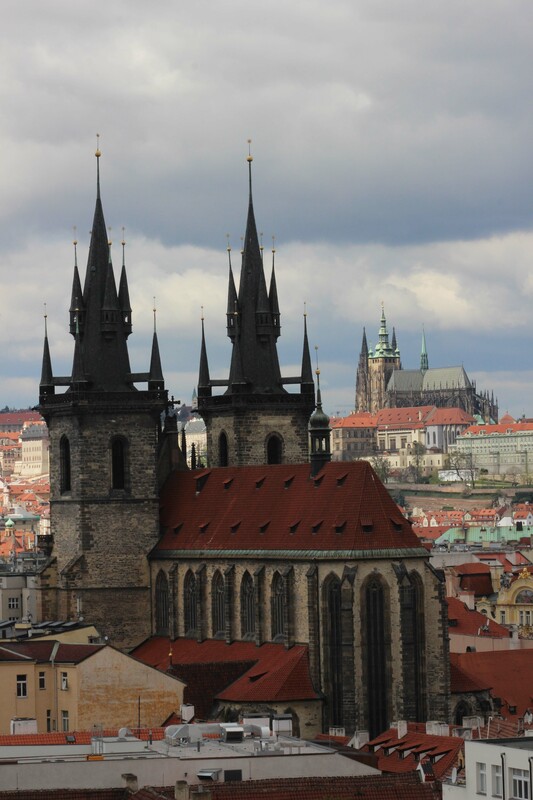 Rather, it began as a gold sculpture of a chalice, put in place by George of Poděbrady. (The same Jiří z Poděbrad our Metro stop was named after.) Why a chalice, and why Poděbrady? First, the chalice was the symbol of a sect of the Hussites, known colloquially as “utraquists,” after the Latin phrase sub utraque specie, meaning “in both kinds,” and referring to the Eucharist. The Catholics at the time distributed the bread to the congregants, but only the priests partook of the wine; one of the Hussites’ main bones of contention with the Catholic Church was that congregants should must* partake of both kinds, as Jesus told his disciples at the Last Supper. 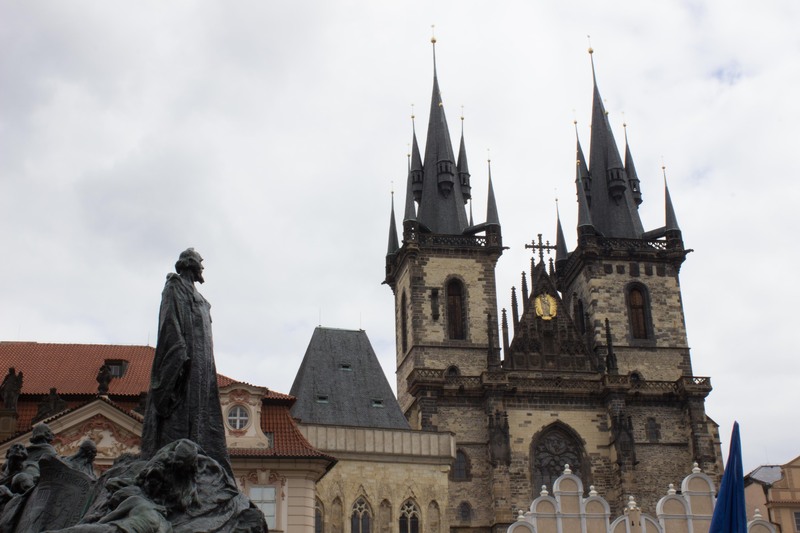 Seems a silly thing for someone to be burned alive over (Jan Hus was indeed barbecued at the Council of Constance, and that’s his statue on the square, in the shadow of the church), but they took their dogma very seriously back then. In any case, Poděbrady put the chalice up on this church as a symbol both of Hussite control and of his own identity as the first Bohemian king of Bohemia since the Přemyslids died out 150 years before his accession. But, much like Hussitism, the chalice did not last. And, much like Jan Hus himself, it was melted down in a fire. Later it was remade into the halo surrounding the Virgin Mary you can see there today. See? Much more interesting than just any old religious icon. The interior of the church does not disappoint either, though if you’re visiting, be sure to note that the main entrance is off the square, through a small passage between the restaurants in front. It is also only open during odd hours: 10:00 – 13:00 and 15:00 – 17:00. However, going inside even for a minute or two is worth it, if only to see the tomb of the great Danish astronomer Tycho Brahe. While Brahe was not able to work with telescopes, and therefore only understood stars’ lack of parallax in the context of their taxonomic contrast to comets, he was one of the most comprehensive observational astronomers the world has ever seen, and his steps forward were incredibly useful in furthering cosmology from the ancient paradigms. Our Lady Before Týn is a gem, but it is hidden in plain sight. While virtually every visitor to Prague will go to the Old Town Square, comparatively few will really notice Our Lady Before Týn. When you visit, make sure you do. Well. The Hussites weren’t condemned because they thought the laity “should” partake of the consecrated wine (which, btw, was common practice for the first several centuries of Church history and therefore not a practice the Church is/ever was against as a matter of doctrine (although in the Middle Ages a renewed reverence for the Eucharist led the species of the wine to be reserved from the laity for fear that it might be spilled or otherwise profaned–note that this is a matter of practice/discipline and not doctrine)). The Hussites thought it was *necessary for salvation* to receive under both kinds. This is different. There are a number of problems with this. – This clam cannot easily account for 1 Cor 11:27. If you consume EITHER species unworthily, you are guilty of BOTH the body and blood of the Lord. – This would seem to contradict the idea that Christ is fully present, body blood soul and divinity, under both species. But if He isn’t, this implies a separation of Christ’s body and blood every time the Eucharist is celebrated, which signifies bodily death. But Christ died only once, and to suggest otherwise is scandalous and also explicitly contradicts Scripture. The Church has always paid very close attention to the symbolism involved in worship. – There is tradition in the Church of people, especially sick people, receiving under only one kind, as they are able. They have never been considered condemned to hell for doing so. Now. My understanding is that once the Church condemned the view that reception under both kinds was necessary for salvation, Huss grumbled and tried to drive a wedge between the Church and local authorities so that people could continue to receive under both kinds. That makes him an unrepentant heretic. Not that I am in favor of burning heretics at the stake–but it makes a lot more sense to know that he was burned not just because he thought Catholics “should” receive under both kinds, but because he explicitly denied Church teaching after it was clearly defined and tried to get others to circumvent it. That becomes a much bigger matter now that transcends the issue of receiving under both kinds: it’s a rejection of the Church, of her teaching authority, and therefore of Christ’s commission for the Church and institution of the Magisterium to be the one true guardian of the truth about Christ. Also, we still take our dogma very seriously, because dogma is truth about Christ, and having access to that truth facilitates an authentic relationship with Him, while heresy, schism, and ignorance do the opposite. We’ve just stopped burning people.